I enjoyed this book very much as I do most dispensational, pretribulational, premillennial books. Twelve authors provide twenty one chapters on interesting subjects including various defenses of the pretribulational rapture: two chapters supporting the “departure” view of 2 Thes. 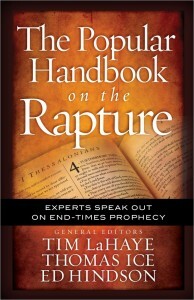 2:3 (by H. Wayne House and Tim LaHaye); reasons for interpreting prophecy literally (by Thomas Ice); why the history of the Jews matters to the rapture (by Michael J. Vlach); why the offer and rejection of the kingdom in Jesus’ day was significant to the rapture (by Arnold Fruchtenbaum); and also a refutation of the preterist view that John wrote Revelation in the 60s AD (by Andy Woods). Well written and worth the small price. 2011 by Harvest House.